ATLANTA (AP) — Democrat Stacey Abrams ended 10 days of post-election drama in Georgia’s closely watched and even more closely contested race for governor Friday, acknowledging Republican Brian Kemp as the victor while defiantly refusing to concede to the man she blamed for “gross mismanagement” of a bitterly fought election. The speech Abrams delivered at her campaign headquarters Friday evening marked the close of the 44-year-old attorney and former lawmaker’s unsuccessful attempt to make history as America’s first black woman governor. Since Election Day her campaign fought on, insisting efforts to suppress turnout had left thousands of ballots uncounted that otherwise could erode Kemp’s lead and force a runoff election. Abrams made no such retreat from her criticisms of Kemp, saying she refused “to say nice things and accept my fate.” Instead, she announced plans to file a federal lawsuit to challenge the way Georgia’s elections are run. She accused Kemp of using the secretary of state’s office to aggressively purge the rolls of inactive voters, enforce an “exact match” policy for checking voters’ identities that left thousands of registrations in limbo and other measures to tile the outcome in his favor. The race grabbed the attention of the nation, with Barack Obama and Oprah Winfrey campaigning for Abrams in the final days and President Donald Trump holding a rally for Kemp. Unofficial returns showed Kemp ahead by roughly 60,000 votes out of nearly 4 million cast on Nov. 6. Kemp declared himself governor-elect the next day and stepped down as Georgia’s secretary of state, though thousands of absentee and provisional ballots remained uncounted. Abrams, meanwhile, sent volunteers across the state in search of voters whose ballots were rejected. She filed suit in federal court to force county elections boards to count absentee ballots with incorrect birthdates. Her campaign even planned for possible litigation to challenge the election’s certified outcome. Abrams didn’t take that route. She said she had concluded “the law currently allows no further viable remedy.” Instead, she said she would fight to restore integrity to Georgia’s election system in a new initiative called Fair Fight Georgia. “In the coming days, we will be filing a major federal lawsuit against the state of Georgia for the gross mismanagement of this election and to protect future elections from unconstitutional actions,” Abrams said, though she gave no details. Kemp tried to move past the contentious campaign even if his opponent wasn’t willing. Kemp had been secretary of state since 2010. He was backed by and had embraced Trump as he tried to maintain GOP dominance in a state that hasn’t elected a Democrat to the governor’s mansion since 1998. Kemp stormed to the GOP nomination with ads featuring everything from the candidate cranking a chain saw and jokingly pointing a gun toward a teen male suitor of his daughter, to Kemp’s offer to “round up criminal illegals” himself in his pickup truck. He’s promised a tax cut and teacher pay raises and pledged to continue Georgia’s refusal to expand Medicaid insurance under President Barack Obama’s 2010 health care overhaul. 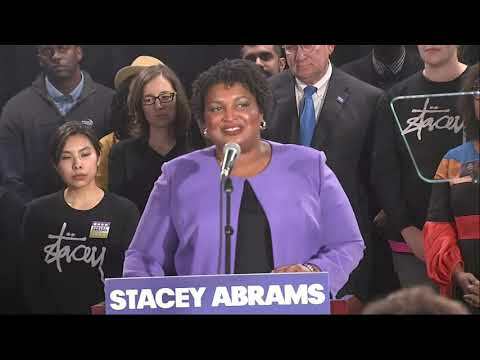 Abrams’ campaign sparked huge energy across the state and she became a national Democratic star. Election turnout among both sides’ energized bases nearly equaled that of the 2016 presidential vote. Aides close to Abrams said that since the election she had been wrestling with competing priorities: She wanted to advance her assertions that Georgia’s elections process — which Kemp managed as secretary of state — makes it too hard for some citizens to vote. But she also recognized that a protracted legal fight would harm that cause and potentially her political future. Kemp’s victory is an important marker for Republicans ahead of the 2020 presidential election. Kemp’s narrow margin already suggests that Georgia, a state Trump won by 5 percentage points in 2016, could be a genuine battleground in two years. Trump bet big on Kemp, endorsing him ahead of Kemp’s Republican primary runoff and campaigning for him the weekend prior to the Nov. 6 election. Now, Trump will be able to return with an incumbent governor as he seeks a second term. Abrams’ political future is less certain. She made believers of old-guard Democrats in Georgia who didn’t think a black woman could compete in a general election, and she emerged as the party’s clear leader. But the party also has plenty of other ambitious politicians who will want to take advantage of the path that Abrams’ has charted. The next big shot for Democrats is a 2020 Senate race, with Republican Sen. David Perdue making his first re-election attempt. Follow Barrow on Twitter at https://twitter.com/BillBarrowAP and Brumback at https://twitter.com/katebrumback.